According to Fortune, 77% of iPhone 4 launch day sales in San Francisco, Minneapolis and New York Apple Stores were from existing iPhone owners looking to upgrade to the latest and greatest Apple handset. 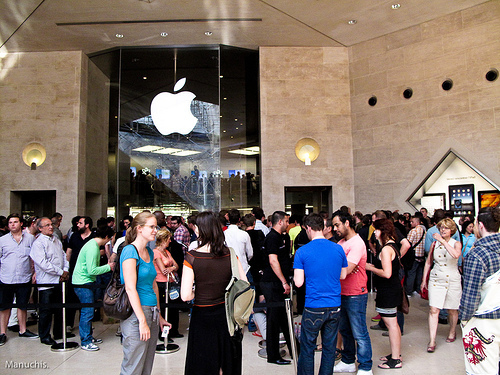 Whilst Apple fans were queuing for hours outside of each store, Piper Jaffray’s Gene Munster and his team interviewed 608 iPhone 4 buyers, asking them the same set of questions as they have on the past three iPhone launch days to keep their data consistent. There was no clear difference between sales of the 16GB and 32GB device, 46% of buyers choosing the former and 54% the latter (up 43% from last year). 84% of those interviewed were on the AT&T network, suggesting 16% had jailbroken and unlocked their iPhones previously. 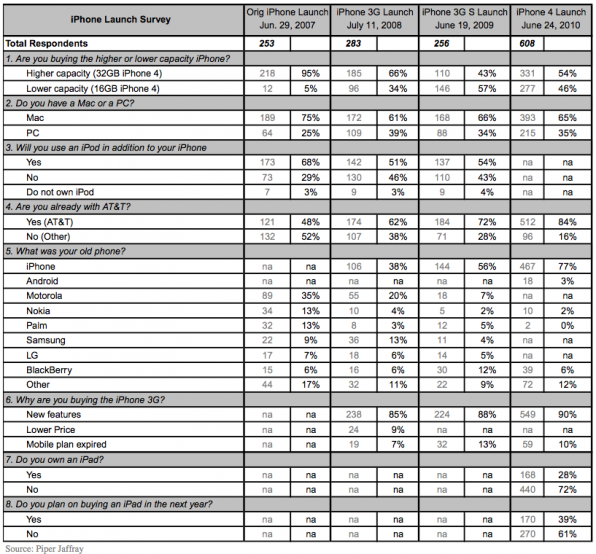 77% of the iPhone 4 buyers they spoke to were upgrading from a previous version. That’s up from 56% in 2009 and 38% in 2008. 28% already had an iPad. Fortune also notes that 6% of buyers were switching from Research in Motion (RIM) devices, 3% from Android and 2% from Nokia. Whilst the survey only included 608 participants, we wouldn’t be surprised if the results were representative of most of all the US sales. The full survey results are embedded below. Do you have the new iPhone? Did you upgrade or is the iPhone 4 your first Apple smartphone? Let us know in the comments. Read next: HUGE. Project Canvas Gets the Go Ahead.